The tripod is designed to release your hands and enjoy video shooting, a great choice for travelers, photography enthusiasts. Portable mini table tripod with 1/4 inch screw, which is compatible for DSLR ILDC Camera for Feiyu Beholder Zhiyun Smooth Q/Crane 2 for MOZA Nebula DJI OSMO Mobile 2 Gimbal Stabilizer. 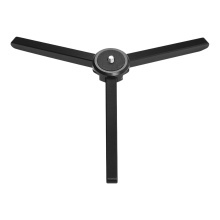 Foldable tripod design, light weight and portable, easy to put in your camera bag or backpack. Tripod feet with anti-skid pads, which provides a better grip performance, safe and stable. Made of high quality aluminium alloy, max. loaded capacity is 5kg, strong and durable to use. Camera, smartphone, smartphone bracket and gimbal are not included.